I’m going to let the dust settle a bit before giving a fuller post on yesterday’s events. That’ll be tomorrow evening or Monday morning after we get a fuller picture on the council elections. Many congratulations to Lutfur Rahman; throughout the count, he was a man barely able to speak due to the stress. He was chewing gum and had a glazed look about him whenever I bumped into him. But maybe that’s just the effect I have on him. So no wonder the emotion came out during his early morning press conference at The Troxy. The audio is here. It’s well worth a listen. At about seven minutes in he mentions his car and justifies its need, but my hunch is he’ll give up the Merc and get a Prius or something else more Ken-friendly. George Galloway swears by the Toyota Prius as well. A few seconds later, his voice breaks and he’s in tears as he talks about the personal attacks on him these past years. Ironically, a couple of minutes later he declines to say John Biggs is not a racist. This doesn’t augur well. However, Lutfur is very pleased by how the council is shaping up. Forty-two seats were up for grabs last night (the three from Blackwall and Cubitt Town will be elected about early July). Counting has been completed for 27 seats: Tower Hamlets First have 15, Labour 9, and the Tories 3. The count was halted at 11am when it had become something if shambles, according to those there. Staff at The Troxy stopped serving any snacks, water or coffee after about 10pm, by which time the police had locked down the venue due to possible crowd trouble outside. I’m told two counting staff fainted, and one was in tears. It was clear that mistakes were being made. So six wards are left to count tomorrow: Weavers, Bethnal Green, St Peter’s, Bromley South, Island Garden and Bow East. I’d be amazed if Labour don’t take all three in Bow. But there could be some hiccups elsewhere. 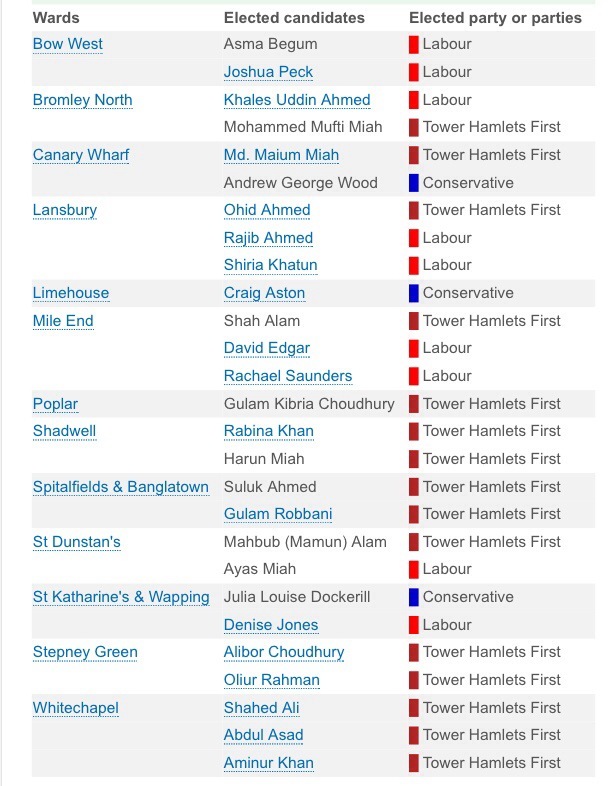 I understand Abjol Miah, the former Respect leader and now THF (which is Respect, let’s be frank) is trailing in St Peter’s, but at least one of his colleagues is likely to be elected. There will also, no doubt, be some mixed results in Weavers and Bethnal Green, while Island Gardens is likely to be Peter Golds and Gloria Thienel for the Tories. 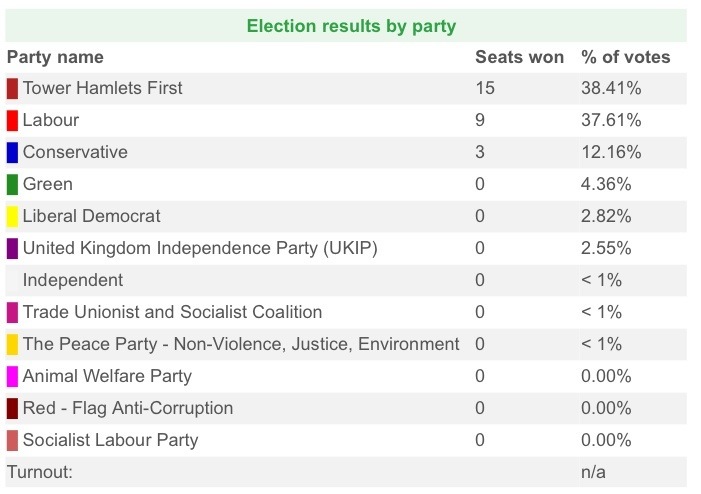 One scenario could be THF finishing on 19 seats, Labour 18 and Tories 5 from last night. When Blackwall is included, the controlling majority will be 23. So we could see a pact between the Tories and Labour to determine committee chairs etc, or we could see three defections from Labour to THF. Longer term, Lutfur and many in his group want to return to Labour. There will now be pressure on Labour to move in that direction. Also, who will now lead the Labour group? After early scares in Mile End East, David Edgar and Rachael Saunders survived, but Motin uz-Zaman fell. And thankfully, Shiria Khatun survived the false allegation of electoral fraud in Lansbury. We’re yet to see if current group leader, the extremely likeable and dignified Sirajul Islam, is elected in Bethnal Green. Josh Peck was comfortably reelected in Bow West, where Labour defector Anwar Khan was easily beaten by his sister-in-law Asma Begum. But I can’t see Josh hanging around for four years as an opposition councillor. Perhaps City Hall or Westminster beckon. Of all those other bigger guns, I suspect David Edgar is the likeliest to be open to a deal with Lutfur.